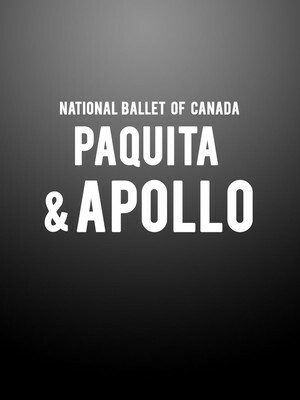 Why See National Ballet of Canada - Paquita and Apollo? George Balanchine and Igor Stravinsky's landmark Apollo leads this eclectic mixed bill featuring works old and new alongside, including the effervescent delight that is Marcus Petipa's Paquita, Julia Adam's career-making Night and Robert Binet's exquisite The Sea Above, The Sky Below. Created in 1928, this genre-defining hit is revered as one of the world's best contemporary ballets, fusing the past and present to craft the future of modern dance. With a score by Stravinsky, it follow the god Apollo as he is visited by the three muses. Canadian native Julia Adams cemented her career with this commission created with composer Matthew Pierce for the San Francisco Ballet in 2001. Highly praised on its premiere, it saw the company tour the work in Paris, London and New York. Joyful and dizzying, this 1881 revision by Marcus Petipa is a spectacular tribute to technique. In a blazing whirl of vibrancy, the story follows a young Gypsy who stumbles across her Royal heritage to the sounds of Edouard Deldevez and Ludwig Minkus. From the National Ballet of Canada's own Choreographer Associate Robert Binet, this beautiful work debuted at the Mad Hot Ballet 2017 gala. Set to Adagietto from Mahler's 5th Symphony and with costumes from Erdem, its a visual and aural treat. Sound good to you? Share this page on social media and let your friends know about National Ballet of Canada - Paquita and Apollo at Four Seasons Centre. Please note: All prices are listed in US Dollars (USD). The term Four Seasons Centre and/or National Ballet of Canada - Paquita and Apollo as well as all associated graphics, logos, and/or other trademarks, tradenames or copyrights are the property of the Four Seasons Centre and/or National Ballet of Canada - Paquita and Apollo and are used herein for factual descriptive purposes only. We are in no way associated with or authorized by the Four Seasons Centre and/or National Ballet of Canada - Paquita and Apollo and neither that entity nor any of its affiliates have licensed or endorsed us to sell tickets, goods and or services in conjunction with their events.